Just to follow up on Mary Catherine’s post about finding data, I wanted to recap the final session of this workshop series that took place tonight. As in the other two workshops, Smith emphasized thinking about who would be keeping this data and why as a part of the critical research process. It’s especially interesting given the size of these data sets and maps, meaning that the person (or corporate entity, NGO, or government agency) likely has a very specific reason for hosting this information. 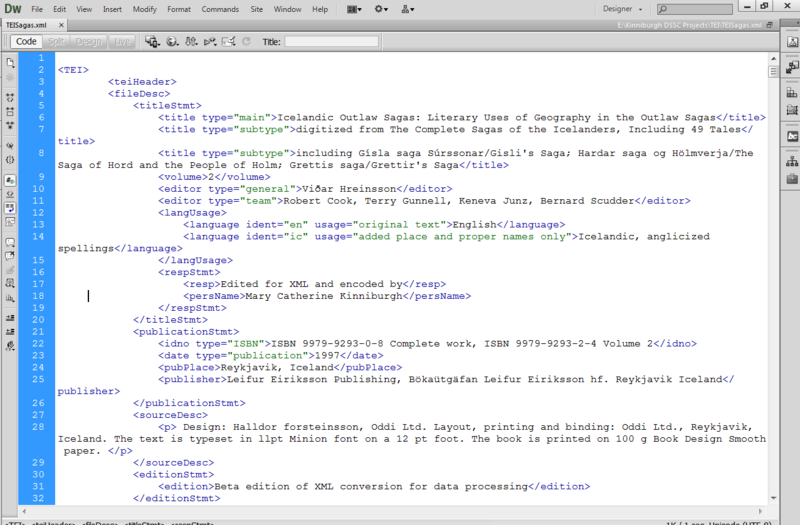 She brought us through a few examples from basic mapping sites, like the NYT’s “Mapping America” which pulls on 2005-2009 Census Bureau data, to basic mapping applications like Social Explorer (the free edition has limited access, but the GC has bought full access) and the USGS and NASA mapping applications. 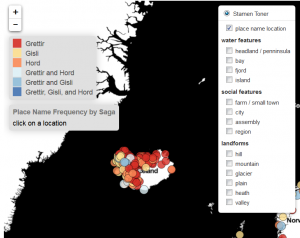 The guide also includes a few more advanced mapping options, like ArcGIS, but the tool that seemed most useful to me, in the short-term anyway, is Google’s Fusion Tables, which allows you to merge data sets that have terms in common. The example Smith used was a data set of demographic data (her example was percentage of minority students) organized by town name (her example was towns in Connecticut) and a second set of data that defined geographic boundaries by the same set of towns. Fusion Tables then lets you map the demographic data and select various ways to visualize and customize your results. My main takeaway from this series was that each of these tools is highly particular and unique, and you have to really dig into playing with the individual system before you’ll even know if it is the right tool for your work. 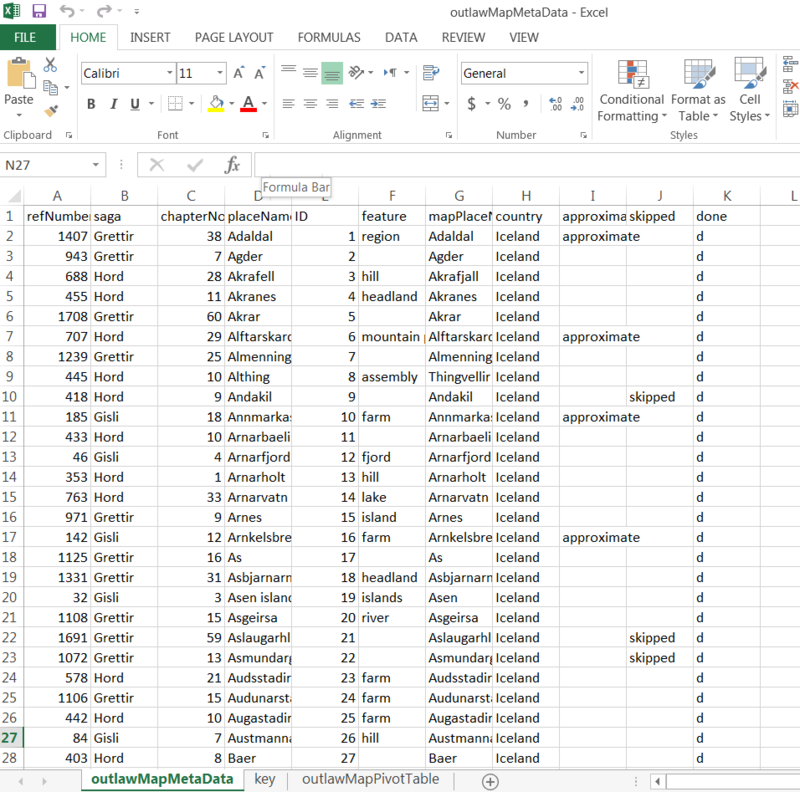 That, and also learn R.
This entry was posted in Fall 2014, Student Responses to Lectures & Workshops and tagged Data, Data Analysis, dataset, dhpraxis14, Digital Libraries, library workshop, mapping data on October 29, 2014 by Tessa Maffucci. Dataset Project: Who do you listen to? 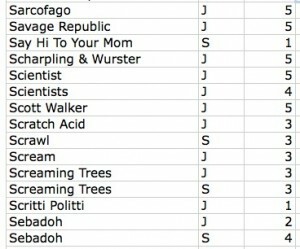 I used an Apple script to extract a list of artists as a text list, which I then put into Excel. I thought about mapping artists to each other through shared members, projects, labels, producers etc, but after looking at the list of over 2000 artists (small by Lev Manovich standards! ), I decided that while interesting, this would be too time consuming. Ultimately I identified 528 artists and J identified 899. An interesting note about this process, after we both went through the list, there were approximately 500 artists that neither of us acknowledged. Some of this can be chalked up to people on compilations we might not be that familiar with individually. The rest…who knows? 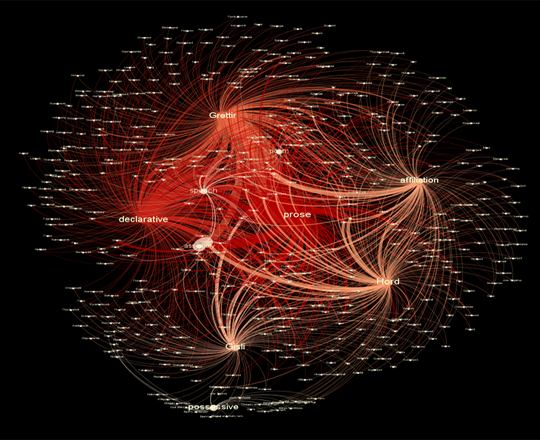 Once this was done I put the data into Gephi. At the end of my last post I was having trouble with this process. After some trial and error, I figured it out. It was a lot like the process I used with the .gdf files in my last post. The steps were: save the Excel file as CSV and uncheck append file extension, then open that file in TextEdit and save as UTF-8 format AND change the file extension to .csv. 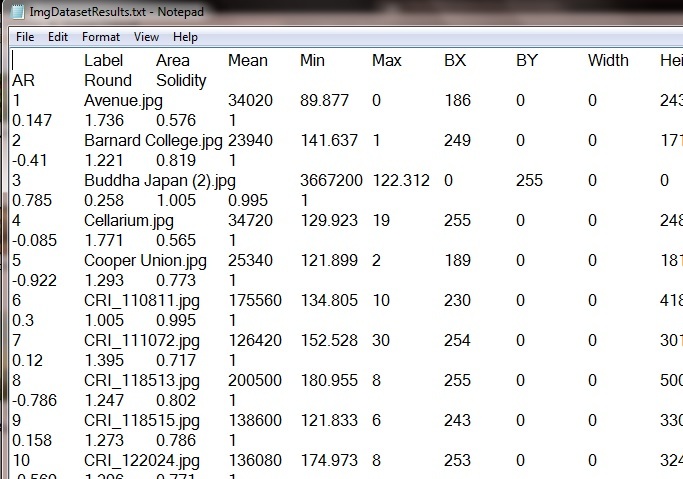 Gephi took this file with no problems. The assigned weight to each relationship is shown in the distance from our individual node, and also in the thickness of the edge (line) that attaches the nodes. It can be hard to see without zooming in closely on the image, since with so many edges it is kind of noisy. 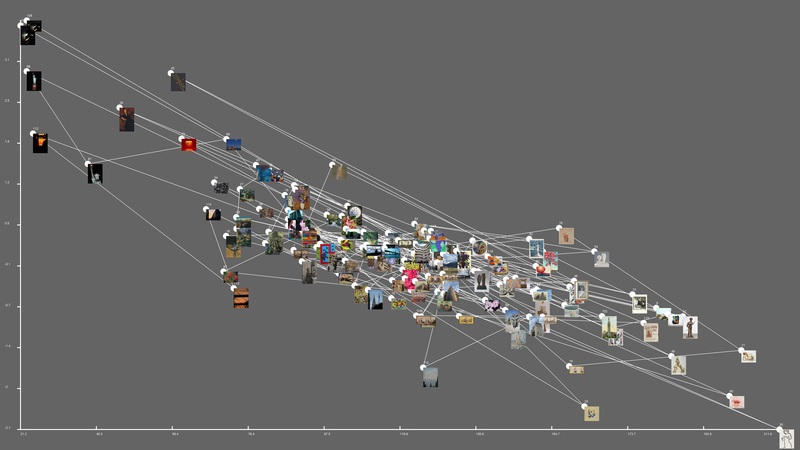 Overall, I like the visualization. It doesn’t offer any new information, but it accurately reflects the data I had. Once I had the trouble spots in the process worked out, it went pretty smoothly. I am not sure if ForceAtlas is the best layout for this information. I will look into other layout options and play around with them, see if it looks better or worse. I made an image with the nodes labeled, but it become too much to look at as a static image. To this end, I want to work on using Sigma (thanks to Mary Catherine for the tip!) to make the graph interactive, which would enable easier viewing of the relationships and the node labels, especially the weights. This may be way beyond my current skill level, but I’m going to give it a go. 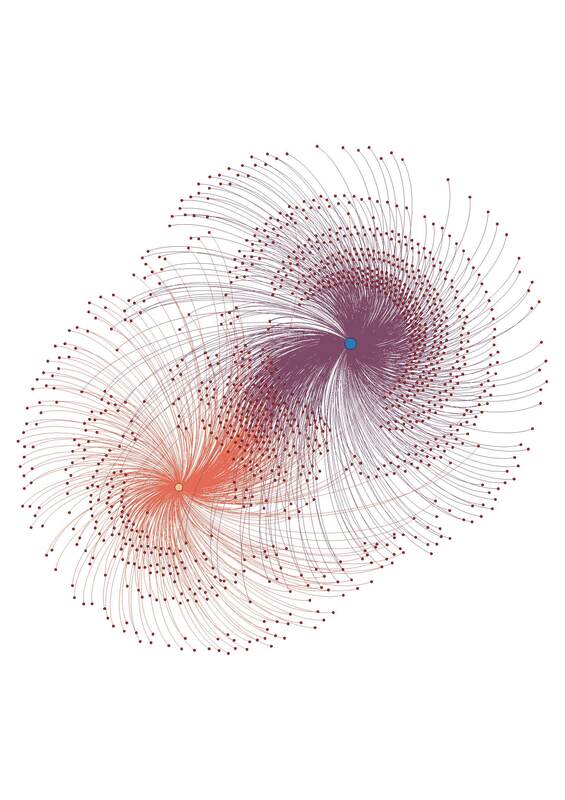 This entry was posted in Fall 2014 and tagged Data Analysis, dataset, Gephi, music on October 28, 2014 by Sarah Cohn. As promised, here’s a link to the “Finding Data” library guide on the Mina Rees Library site. Apologies if someone has posted it already! The guide was created by the wonderful Margaret Smith, an adjunct librarian at the GC Library who is teaching the workshops on data for social research. There’s one more–Wednesday, 6:30-8:30pm downstairs in the library in one of the computer labs–and I’m sure she’d be happy to have anyone swing by. Check out the Library’s blog for details. Who has an interest in collecting this data? If federal/state/local agencies or non-governmental organizations, try locating their website and looking for a section on research or data. If social science researchers, try searching ICPSR. What literature has been written that might reference this data? Search a library database or Google Scholar to find articles that may have used the data you’re looking for. 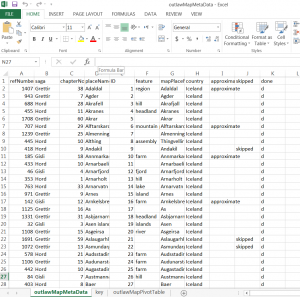 Then, consult their bibliographies for the specific name of the data set and who collected it. From a reliable source? Who collected it and how? In a format I can use for analysis or mapping? Will it require any file conversion or editing before I can use it? Comparable to other data I’m using (if any)? What is the unit of analysis? What is the time scale and geography? Will I need to recode any variables? Consider data as an argument. Since data is social, what factors go into its production? What questions does the data ask? And how do the answers to these questions, as well as the questions above, affect the ways in which that dataset can shed light on your research questions? All fantastic stuff–looking forward to seeing more of these data inquiries as they pop up on the blog! 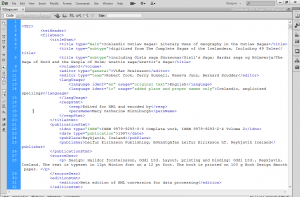 This entry was posted in Fall 2014, Resources & Links of Interest and tagged Data, Data Analysis, dataset, dhpraxis14, Digital Libraries, library, The Graduate Center on October 28, 2014 by Mary Catherine Kinniburgh. This entry was posted in Uncategorized and tagged Data, dataset, new york city on October 24, 2014 by Stephen Real.